You can read the entire letter, which Pfc. Porter wrote to his parents from Dachau here. Behind the furnace was the execution chamber, a windowless cell twenty feet square with gas nozzles every few feet across the ceiling. 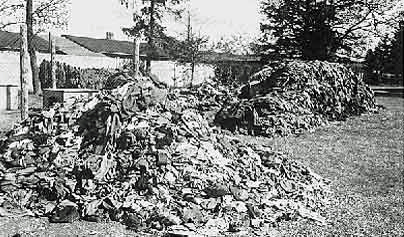 Outside, in addition to the huge mound of charred bone fragments, were the carefully sorted and stacked clothes of the victims – which obviously numbered in the thousands. Although I stood there looking at it, I couldn’t believe it. The realness of the whole mess is just gradually dawning on me, and I doubt if it will ever on you. 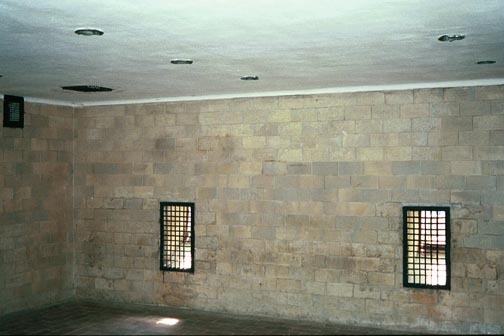 Technically, these two openings on the wall of the Dachau gas chamber are not windows; there is no glass covering the openings. 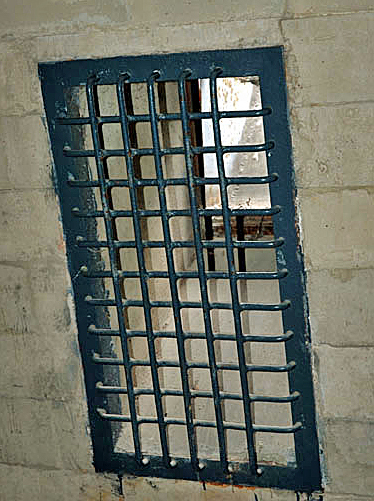 The openings were connected to chutes on the wall outside the gas chamber. According to the tour guides at Dachau, these openings were used to put Zyklon-B pellets into the gas chamber. According to Pfc. Porter, the gas came through “gas nozzles” on the ceiling. 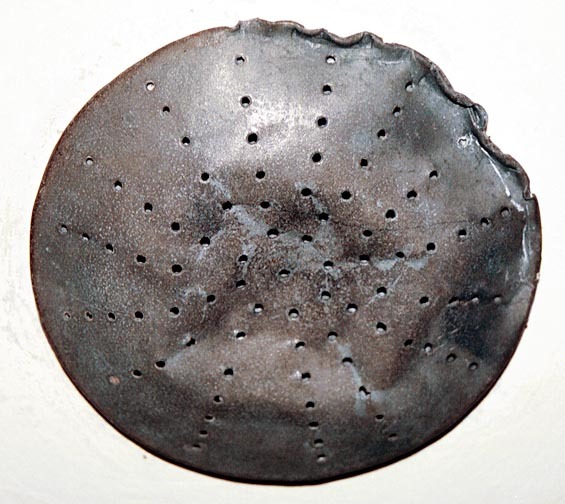 Actually, the Zyklon-B gas was in the form of pellets, which could not go through a nozzle. 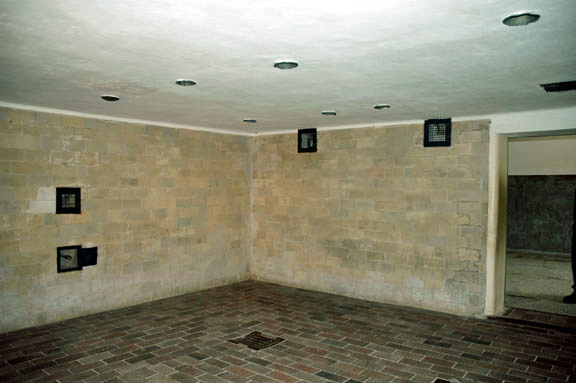 My photo below shows one of the nozzles on the ceiling of the Dachau gas chamber. 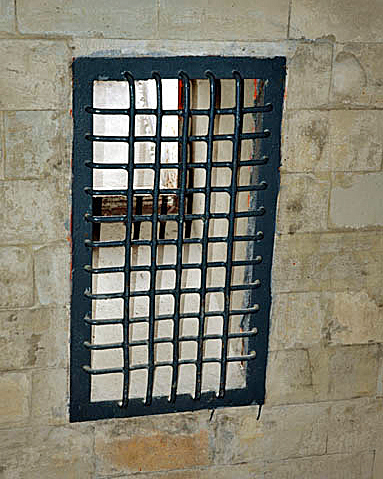 Is it possible that the US Army constructed the two little windows on the wall of the Dachau gas chamber, after they learned that the gas could not have come through the shower heads? No, no, no! Americans would never do something like that. Don’t even suggest this in the 19 countries which have laws against Holocaust denial, or you might end up in prison for 5 years. The family of Harold Porter should keep his letter private, lest he be indicted for Holocaust denial posthumously. Even worse, he could be accused of implicating the US Army in the construction of the little windows in the Dachau “execution room” AFTER the camp was liberated.